Text from Your Desktop -- and Save Big! Voxox offers dramatically lower texting rates than the major carriers. 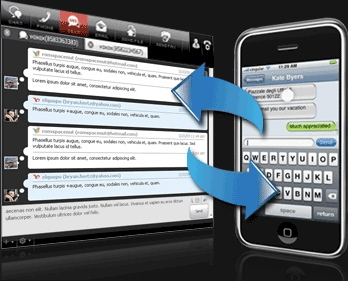 You also get additional features, such as follow-me texting and more. If you haven’t seen the movie Network I suggest you stop everything (well, after you’ve read this), find it, watch it, and then this might make more sense to you afterward. With the help of a certain crazy-eyed fictitious network anchor named Howard Beale, we’re going to explore how texting with your cell phone carrier is an expensive proposition, and how using Voxox can save you big. Below are actual quotes from the movie to help us along with this post. Just like you, we’re sick of cringing as we open our cell phone bill having no idea, or worse, too much of an idea of how bad it will be. It’s the kinda thing that can drive you a little crazy. Cell phones have become an integral part of our life. Many of us (myself included) can’t leave the house without one. But don’t we all have a breaking point? Where we are no longer willing to pay through the nose for what has become a basic right. That’s why we, the good people at Voxox, created plans for you to save boatloads of money on your monthly cell phone bill. Save enough and you might even be able to buy a boat…or at least pay next month’s rent. T-Mobile: Ever tried to find this info on T-Mobile’s website? It’s like doing graduate level research they have it so well hidden there. Verizon: Not too easy to find, but good ol’ Google came through for me. $0.20 to send and receive texts domestic. $0.25 to send and receive texts sent to non US numbers, when you’re in the US. Sprint: Also makes it hard to find this information. Click on the “messaging link” and it shows you how to send a text message. Thanks Sprint. Why is this so hard? Anyway…this is the best I could come up with. AT&T: Finally! A phone company comfortable enough not to hide their texting rates! Kudos to you AT&T. But, geez…that’s a lot…anyway. Now all of these carriers have unlimited texting plans, which of course would offer a better deal, but they range from $10/month (Sprint) to $20/month (AT&T) for domestic texts. So what are we supposed to do? Note: unlimited domestic plan are $4.95 per month; international plans are $9.95. Click here to learn more. Once these cell phone carriers realize that charging such an exorbitant markup is crazy, maybe prices will drop. But for the meantime, start texting your friends from your desktop (using the Voxox client software), with a real phone number, just like you would with your regular phone. But this time, it’s not going to cost you everything you got just to stay in touch with people. Especially when you want to stay in touch, but not actually, you know…talk to them. Thank you very much, enjoy the movie ... and keep on Voxing!